The circumstances and portrait suggest to me that this could be my grandmother. Some of the information doesnt fit, though. 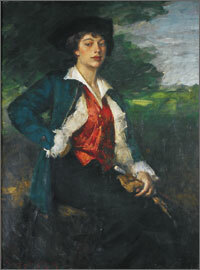 This is a large portrait of an eighteenth-century young gentleman courtier painted by William Merritt Chase (1849–1915) in 1912. It is actually a prize that was won by the sitter, 14-year-old Isabella Lothrop, for the best costume at Chase’s Bruges summer painting school. Chase brought the painting home and showed it at numerous museum exhibitions before returning it to its owner. my grandmother was born in 1890, however. EMy grandmother would have been in her late twenties.